Coming from a Cajun influence, this sauce uses a lot of spices to deliver a garlicky, oniony, and spicy experience against a sweet and tart base. This bottle of sauce was sent to me by Dallas Cooley, one of four brother's behind Jeaux's Boys—named for their mother, Jo. 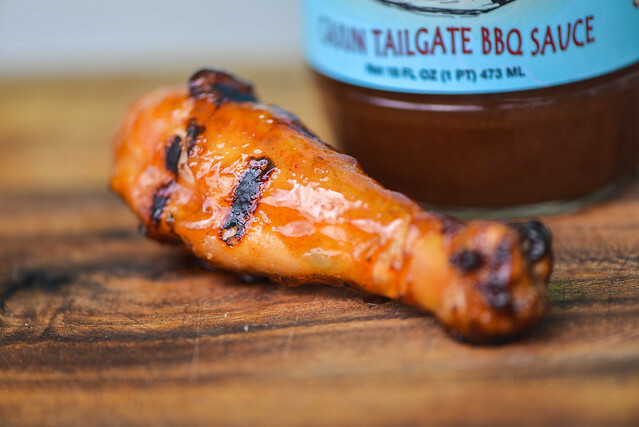 Based out of Baton Rouge , LA, this sauce takes influence from the native Cajun cuisine and the brother's love for tailgating. 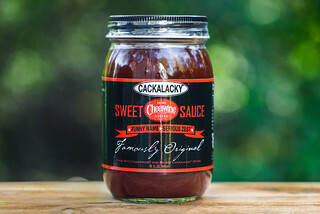 The sauce hit the market in April of this year and can already be found in numerous select stores in Louisiana, as well as online at Cajun Grocer. Spices usually tend to take a back seat in the aroma department, but in this sauce, they're right upfront. Garlic, onion, and chili powder all fill the nose at first, along with more spices that are more difficult to discern, but are obviously there. The spices come along with a tangy vinegar that's balanced with sugar in a way that it doesn't singe the nose at all. Behind the spices, sugar, and vinegar there's a faint citrus note, most likely from lemon. Jeaux's Boys has a medium-thin jelly like consistency. Almost like thinned Jell-O, it's transplant and has a bit of a jiggle when you shake it. Through it's light orange hue, it's clearly visible how loaded up this sauce is with spices—they're heavily speckled throughout. From a suspended spoon, a large amount of sauce promptly falls first, followed by a quick, steady drizzle the continues until almost no sauce is left clinging to the spoon. 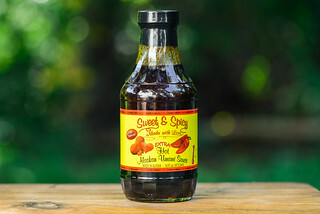 The sauce has an initial flavor of super seasoned vinegar. A heavy tartness is loaded with spices that creates a distinct Cajun feel. Like with the aroma, there are heavy chili, garlic, lemon, and onion components, but the heat is turned way up so the sauce begins its long burn early on, then keeps lingering even after all the sauce has left the tongue. There's a sweetness at the outset that's quickly taken over by the vinegar. When mixed with all the chili powders, the vinegar is a large part of the spicy and sour aftertaste. This sauce coated the chicken lightly, but evenly. A nice coating built up after multiple brushings though and baked down well over indirect heat. When moved directly over the fire, the sauce caramelized well without burning. The flavor was more balanced after being cooked—the sweetness was turned up, which dialed back the tartness of the vinegar a lot. The spices all stayed where they were though, giving the chicken leg a very flavorful Cajun kick without it being so heavy-handed that it masked the flavor of the meat altogether. This was one of the more interesting sauces that I've come across. 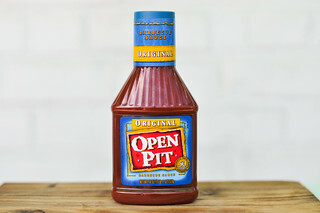 It certainly delivered on the Cajun label by being more heavily seasoned than the average barbecue sauce, and used those spices to deliver most of the flavor. 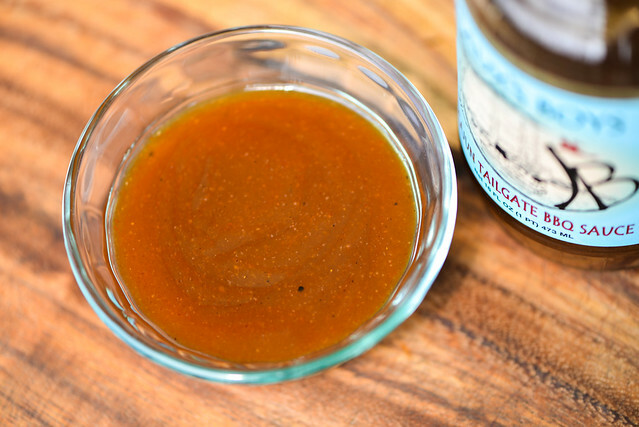 Losing the reliance on more liquids came at a fault though—having a primarily vinegar and sugar base made the sauce a little too tart out of the bottle by not providing enough other ingredients to balance out the vinegar. After being cooked, the tartness mellowed out a lot and I think the sauce found its happy place. 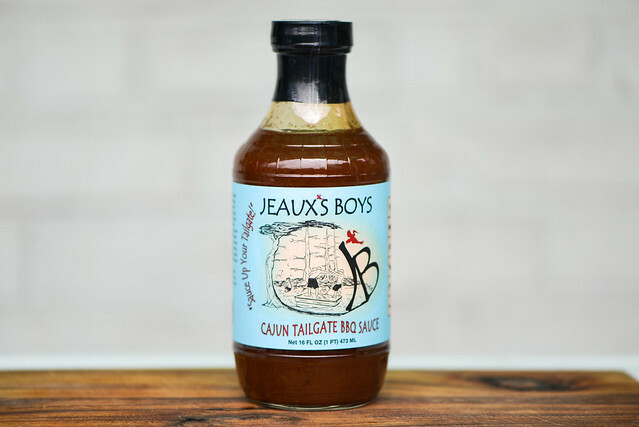 It's definitely a unique sauce and delivers a different experience than your standard barbecue sauce—so if you're looking for a nice spice with a kick of heat, Jeaux's Boys Cajun Tailgate BBQ Sauce will do you well on those pieces of grilled chicken, pork chops, and other light meats where its Cajun flare can really shine.